Below are some facts, check the menu left for tips and more. Denali (The High One) is the Native (Athabascan) American word for North America's highest peak, Mount McKinley in the mountain chain called the Alaska Range. Denali was renamed Mount McKinley for William McKinley, a nominee for president, by the Princeton graduate and gold prospector, William Dickey. Dickey was one of the hundreds of prospectors seeking gold in the 1896 Cook Inlet stampede. He had written an article for the New York Sun where he described the mountain as the highest in North America at over 20,000 feet. "When later asked why he named the mountain after McKinley, Dickey replied that the verbal bludgeoning he had received from free silver partisans had inspired him to retaliate with the name of the gold-standard champion. " Since the turn of the 19th century, the official name of this great mountain has not rested in peace. In 1914, following his historic first ascent of the mountain in 1913, Hudson Stuck wrote in the preface of his book, The Ascent of Denali: "Forefront in this book, because forefront in the author's heart and desire, must stand a plea for the restoration to the greatest mountain in North America of its immemorial native name." Routes There are many different routes up Denali some extremely technical. Denali's most used route is the West Buttress route (80% of all climbs), which has seen more than 20,000 climbers, Roughly 50% of the climbers have reached the summit. Until 1997, about 400 accidents were reported on the West Buttress route, which claimed the lives of 34 climbers, mostly while descending. "The fact that the West Buttress route is not technically difficult should not obscure the need to plan for extreme survival situations. Of course, some climbers manage to get up and down in perfectly nice, but rare period of weather; when back home, they encourage others to climb this 'easy walkup' of a mountain. Little do they realize that it was only by sheer luck they weren't trying to keep their tent up in the middle of the night in a 60mph wind at 40° below zero, with boots on and ice axe ready in case the tent suddenly imploded. Because of the non-technical reputation of the popular West Buttress route, it is a terribly underestimated climb." Height 6194 meters or 20,320 feet. The difference in the barometric pressure at northern latitudes affects acclimatization on Denali and other high arctic mountains. Denali's latitude is 63° while the latitude of Everest is 27°. 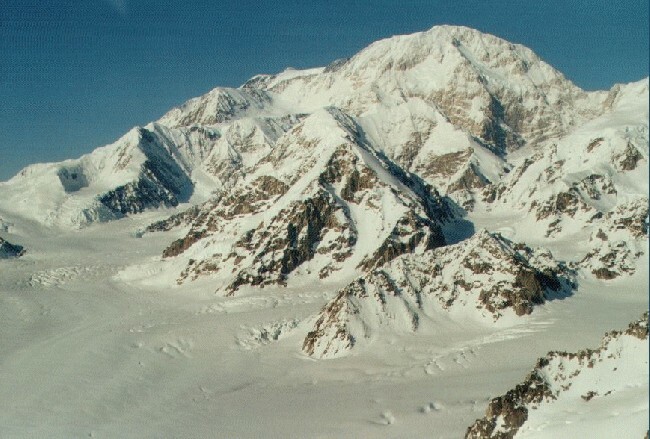 On a typical summit day in May, the Denali climber will be at the equivalent of 22,000' (6900M) when compared to climbing in the Himalayas in May. This phenomenon of lower barometric pressure at higher elevations is caused by the troposphere being thinner at the poles. First Ascent: The lower north peak was first climbed on April 3, 1910 by a group of climbers bringing a 6 by 12 foot American flag and a 14 foot spruce pole. See this excellent Denali park page for more historical facts and a timeline of ascents. Winter climbing in Denali borders on the ridiculous more because of its unfathomable risks than because of its mountaineering challenge. Some of the world's best climbers have either disappeared or perished form literally being flash frozen! In winter months, the jet stream, +100mph (160 km/h), will often descend over the mountain's upper flanks. Combine this wind with the naturally caused venturi effect that doubles wind velocity in such areas as Denali Pass and you will find one of the most hostile environments on this planet. The combined effect of ferocious wind and extreme cold easily and routinely send the wind chill off the charts. (from the Denali park website). Please take time to read this excellent article (PDF, 100kb) South Districs Ranger Daryl R. Miller has written about the Alaskan outback. Do not underestimate the mountains or outback of Alaska. Published here with permission from Daryl.